It’s been quite some time since I’ve put together a Friday Fragments post, let’s see if I remember how this goes! Today has been the hottest day ever on record in Sydney, 45.8°C (114.4°F) at Observatory Hill in the city. My Twitter stream and Facebook newsfeed are full of screenshots of people’s weather apps and pics of car temperature readings, some showing as much as 47°C (116.6°F). We’ve dealt with this glorious weather by bringing the rabbits inside, closing all the blinds and curtains, cranking the air-con up and hiding. Except my husband, who has gone to the Big Day Out music festival. Madness. 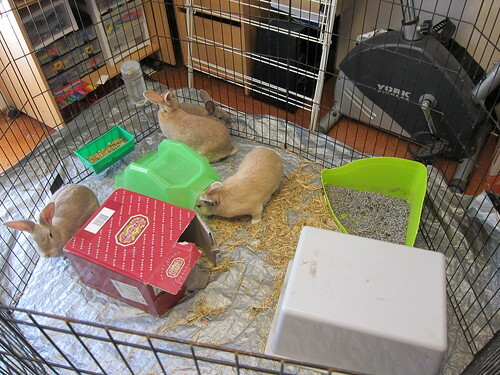 The rabbits weren’t too pleased to be bundled inside into temporary accommodation, especially as the dog considers them to be some kind of live entertainment for her and likes to lie, just outside their enclosure, watching them. At one point they decided having the dog hanging around was all too much and took to playing a game of sardines in the one decent hiding spot. They ended up with 5 of them squeezed into the one box with only Carrots left out in the open. My Dad is back at the rehab hospital having fully recovered from the lithium toxicity. His knee is also doing well, the physiotherapist has managed to get it bending to about 90 degrees. TRIGGER WARNING for gory details for the next bit, skip if you’re squeamish. The back story to this is that at 12:30am-ish on Dec 8th my father, who lives alone, fell in his bathroom and put his knee through a vent tile in the side of his bath. The tile smashed, sliced big flap of skin off his knee, broke his knee-cap and took a chunk out of his quadriceps tendon. He dragged himself to his bedroom to get his phone, rang my mum, and then to the lounge room to find the phone number for the building manager because, well, it seemed necessary at the time apparently (the carpet has NOT recovered despite two cleanings). Mum called the ambulance and went to Dad’s place and then to the hospital with him. I’m eternally grateful that I didn’t have to do that part. Anyway, there was surgery and worry over whether there was enough blood supply to the flap of skin that had been sliced (there was) and uncertainty over whether the tendon repair, at 4cm shorter than before, would hold (so far so good). They got him back onto his feet at the hospital and then moved him to the rehab place on Dec 14th but Dad seemed to get weaker instead of stronger and increasingly confused and lost his appetite and his tremor got so bad he couldn’t feed himself and he couldn’t find words when he tried to speak and it was all very worrying. Then they tested his lithium levels (Dad’s bipolar, that’s why he’s on lithium) and went “OH! Sky high. That’s why.” and carted him back off to hospital on Jan 2nd to put him on a drip and flush it all out of him. 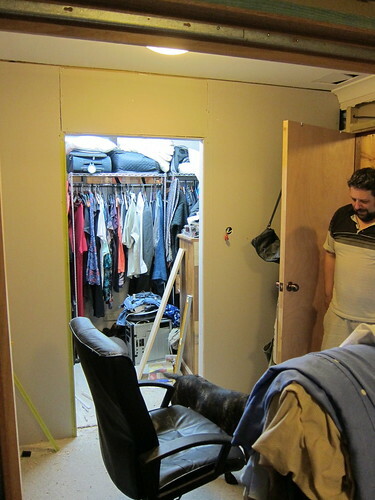 The walk-in wardrobe wall building has been plodding along, there’s a bit more gyprocking and tidying up to do on the inside and then we’ll be able to move my chest of drawers in there and tidy up our bedroom properly. We’ll probably leave the new windows installation, cornices, plastering, painting, skirting boards and architraves, and carpeting until we’ve finished all the other bits of the house, but at least the room will be functional. That’s all from me folks, if you’d like to read up on what other people have been getting up to this week then click through to Mrs4444’s place for lots more Friday Fragments. 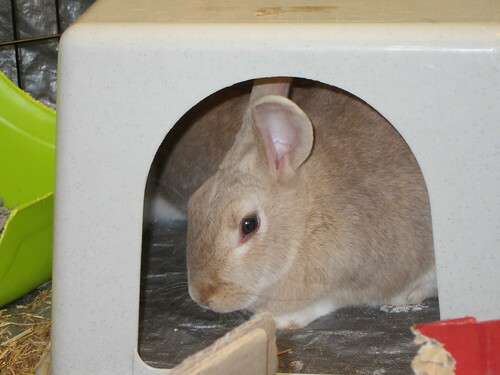 My son is sitting beside me loving the bunny pictures. Thanks for sharing. 114 degrees?! I admit, I’m sick to death of the permanent frost on my driveway and the 28 degree weather, and would love to move to Arizona, but 114?! Yikes. Your dog is So Cute. I don’t know what kind of dog it is (I’m good with that sort of thing) but I can see him sitting next to the couch, head in a lap, snoring away. Yay for remodeling. And even better, remodeling that’s almost done! We’ve been renovating for a year, I am so ready to be done with it all! Funny that you had 114 degrees and our HIGH in a couple of days is supposed to be -1!!! Of course you ARE having summer while we enjoy winter. I usually say I’ll take cold over heat any day, but that cold? I’m not so sure! 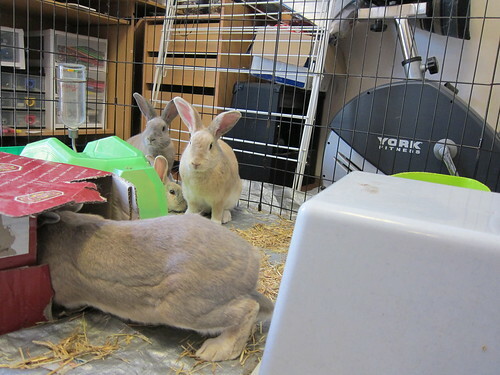 I can’t believe all 5 bunnies managed to fit in that box! That was really funny. Sorry about your dad. I used to take lithium and remember having to have my blood tested every 3 months or so. I hope he’s better soon. Thanks, Dad seems to be fine now, of course he now has to find the right balance of meds again, which is a bit worrying. Oh, my goodness, so hot! I can’t imagine and hope the heat wave breaks soon! 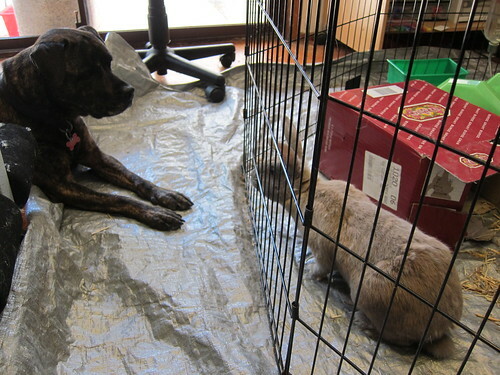 Your bunnies are adorable…..bet they are skittish about the dog watching! They don’t mind as long as she doesn’t pounce at them, when that happens there’s lots of thumping in protest. Hahaha, we are playing the finance game too!! Or hubby is playing, I am sometimes being dragged along in the game kicking and screaming 😉 But I have to hand it to him, we have something in savings now and it’s all thanks to him. I had to skip the icky part, I do have a weak tummy, but I hope your dad is doing better. Holy hot temps, Batman!! Now I have something else to tell the kids. We were studying the earth’s rotation with my 8yr old. I mentioned that while we are so cold and in the dark here, places like Australia were toasty. Now I have a number to go with toasty 😉 Keep hydrated! Yikes it is hot there! Here in Philadelphia we are expecting a dip into the 30’s all next week. We havn’t had much snow yet. Your poor Dad:( I hope he gets regulated and stays that way. We are starting our year of renovating in February. I just keep telling myself I will be so happy when it is finished! Wow! I had no idea it got that hot there! Stay cool! 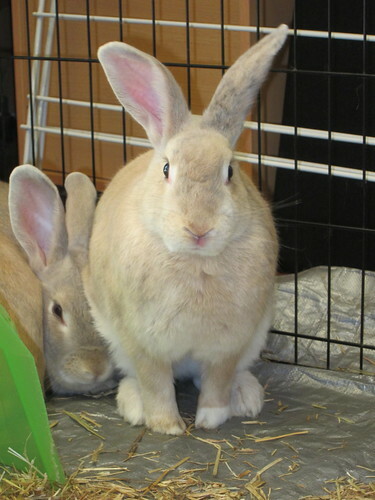 Your bunnies are beautiful! Are they strictly pets? Your poor dad! I’m really glad he’s okay now, and I’m glad I landed here on a good day to catch up–Thanks for linking up! I read this ages ago when it was STILL hot, but after the cool weather and rain I can still vividly recall that heat over those couple of days. It’s testament to my enjoyment of learning about your life that I can tolerate all those bunny pics. But even to my phobic eye, I can tell they are fine specimens. Hope your dad is doing better now – the human body is a complex thing.